Fuzzy-skinned peaches are part of the stone fruit family. There are hundreds of peach varieties, and all fall into two main categories: freestone (with easily removable pits) and clingstone (with firmly-attached pits). Most fresh peaches sold in markets are freestone, while clingstones are used primarily for canning. Eating perfectly-ripe peaches over the sink is one of summer’s greatest pleasures. But why stop there? Make the most of peach season by adding this delectable fruit to a variety of dishes. Blend peach slices into smoothies or tuck diced peaches into decadent cheesecakes. From traditional cobblers and crisps to updated dessert twists (peach shortcakes, anyone? ), peaches add a burst of honeyed flavor to any treat. Desserts aside, don’t forget to add peaches’ bright, sweet flavor to main courses. Thread slices through kabobs for grilling, or dice them and mix a quick fruit salsa to serve with fish and chicken dishes. Pork dishes shine when slathered with a peach glaze or paired with grilled peach halves. You’ll find more savory and sweet ideas in our peach recipe collection. Just remember to squirrel away a few jars of freezer jam before the season ends. You’ll thank us later. 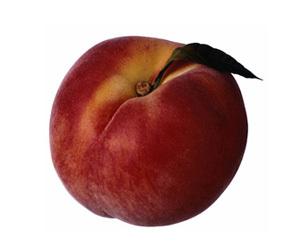 Select peaches that are free of bruises and have a deep, fruity aroma. If you’re using the fruit immediately, select peaches that yield to gentle pressure along their seams and are slightly soft. Avoid any that feel very soft. When ripening fruit at home, select peaches that are firm but not hard. Peaches will soften and become juicier as they ripen, but they will not become sweeter. Purchase only the amount needed as peaches spoil quickly, even when less ripe. Ripen firm peaches in a loosely closed paper (not plastic) bag at room temperature for 1 to 2 days; check daily for ripeness. Peaches are ripe when they yield to gentle pressure. Use ripe peaches immediately or refrigerate up to 5 days. For best results, use ripe peaches within a few days. Do not refrigerate unripe peaches. This inhibits ripening and causes the fruit to become dry, mealy and flavorless. Peaches can be eaten with or without the skin, although they are often peeled when used in cooking and baking. If skin is left intact, wash peaches before cutting. Fresh peaches may be served chilled or at room temperature. For maximum flavor, allow the fruit to reach room temperature. Remove pits from freestone peaches before slicing. To pit a freestone peach, cut it lengthwise into halves around the pit. Twist the halves in opposite directions to separate them. Remove the pit with the tip of a knife. Clingstone peaches cannot be pitted. To slice or quarter them, make cuts with a paring knife toward the center and then around the pit, lifting out each slice. To prevent cut peaches from turning brown, toss them immediately with lemon, lime or orange juice. Blend peeled, sliced peaches into smoothies and shakes. Top BREAKSTONE’S Cottage Cheese or yogurt with sliced or chopped peaches. Serve sliced or puréed peaches as a topping or sauce over ice cream, pancakes and angel food or pound cake. Toss diced or sliced peaches into fruit salads or green salads. Substitute chopped peaches for mango or papaya in tropical fruit salsas. Grill peach halves and serve them alongside grilled chicken and pork. Grilled peaches are also delicious with ice cream.